What Western Saddle Seat Size Do I Need? What size of Western saddle seat will you need? Well, that depends. Not the answer you wanted to hear, right? Let's explain why this seemingly simple question isn't so straightforward. Keep in mind that Western saddle seat size refers to rider fit and has nothing to do with how the saddle fits the horse. There should be approximately four inches between the front of your body and the fork (or swells). Your rump should rest on the base of the cantle, but should not be pressed against the back of the cantle. 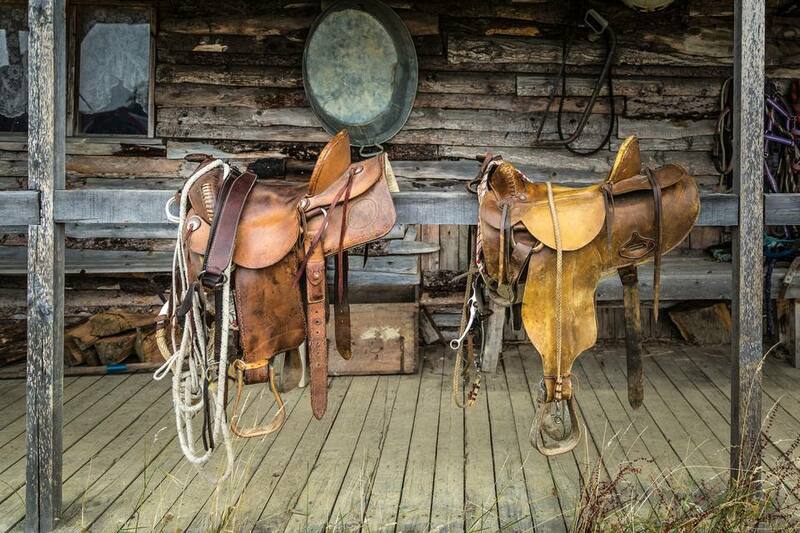 All western saddles come with a stated seat size. Seat size simply measures the distance from the base of the horn to the top middle of the cantle. This distance is then expressed as a size in half-inch increments from 12 inches to 17 inches. With a published saddle seat size, choosing the right size saddle would seem to be pretty straightforward. In reality, seat size is just one factor determining the fit of a western saddle. Sit in the same size of a variety of different styles and brands of saddles and you'll find significant differences in the fit. You might find that a 14 1/2" Circle Y barrel racing saddle fits well, but that you need a 15" in a Dale Martin ranch saddle. Seat Depth: Some saddles have deep seats designed to keep you in place during extreme activity, and others have shallower seats to allow for more movement. Seat Slope: The seat angles from the hand-hold back towards the cantle and the slope can range from relatively flat to steep. Cantle Slope: The cantle can be high and straight or have a slope that is mild or steep. Cantle Dish: The cantle can be flat or have a recess or dish on the front side that can be an inch or more in depth. Fork Style: Fork styles can range from wide swells to slick fork saddles with barely any swell. Fork Angle: Forks can be straight or angle away from the rider. Each of these features can affect the way a saddle fits a rider. Unfortunately, none of these other measurements are standardized or published in a saddle's measurements. So, when shopping for a western saddle, the only way to determine fit is to sit in each saddle. Only then will you know if the saddle is a good fit for you.